this tire towers over me even when i have my boots on (the boots making me just shy of 6′ so i suppose this tire is 8 or 9′ in diameter. super wow dang!). yea ha!! i am in Lubbock! Friends, friends and tubes. it just doesn’t get much better than this…they even had fresh margarita’s made up for my arrival at their doorstep, chocolates and a fancy water bottle by my pillow, and fantastic homemade dinner that was slaved over all day, plus more! i do really need to figure out how to not just use these mammoth tubes but the stupid big tires as well!!! though i am not sure my truck would even haul one. ummm this girl is filthy…AGAIN. this is probably why i’ve avoided the pricey chica jeans. i am so terrible about switching to my play clothes to harvest art supplies in and not my girlie jeans! dang it all. oh happy happy filled up truck! here is a life time source of tubular happy kathy art crap. 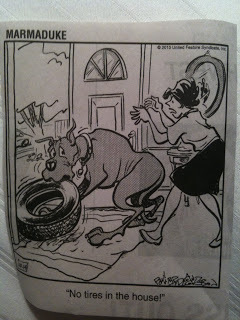 Honestly I can’t imagine why the marmaduke comic showed up on my bed at my arrival. Wink wink. Ha. Mecca!!!!!! Oh thank you thank you Gregory York of York Tires in Lubbock who lets me harvest from the detritus of tractor and construction vehicular tube cast offs! OH MECCA!